Go Green and Get Rewarded. 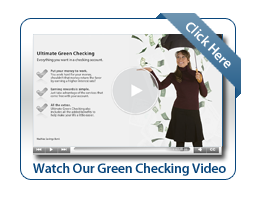 If you prefer online banking, electronic statements, and earning interest on your cash, our Ultimate Green checking account could be a perfect fit for you. Account must be enabled to receive an eStatement. Log in to MSB Online a minimum of one time each statement period. * To qualify for free ATM access nationwide, you must meet the statement period criteria. When all four of these requirements are met, ATM surcharges will be refunded for that statement period. To receive the higher interest rate, you must meet the statement period criteria. If your balance exceeds $10,000.00 a lower interest rate will apply to the entire balance. Fees may reduce earnings on the account. ** Must enroll and maintain paperless statements, MSB eStatements, within 30 days of checking account enrollment. If not, an $8.00 fee will be charged each statement period.